I've had some reader questions about running during pregnancy, so I thought I would touch on it briefly! I'm obviously not a doctor, but I can tell you what I've learned and my thoughts about it. The general rule of thumb regarding exercising during pregnancy is that you don't want to take up any new activities that you didn't do prior. So, if you run now (and there are no other complications) you're perfectly fine to continue running throughout your pregnancy. My doctor has encouraged me from the beginning to keep a good exercise routine to stay fit, and I'm so thankful that at 23 weeks I'm still making it a priority during the week. It truly keeps me sane (is that weird to admit? ), just like before, and I feel wonderful afterwards. 1. 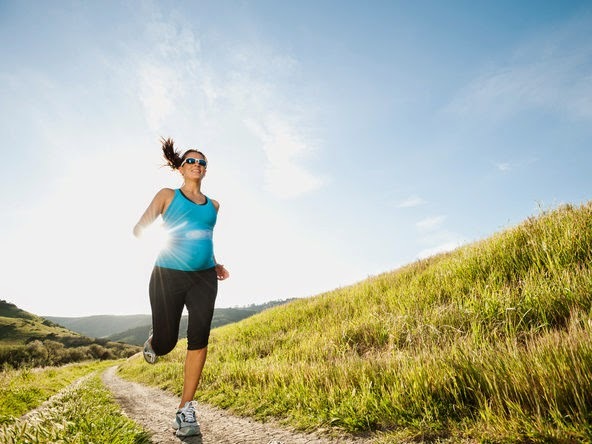 Know Your Limits: On the days you feel too tired or sick, don't push it by going for a run. Just skip a day or two. It's important during pregnancy to rest when you need to rest. Go by the cues that your body gives you. 2. Take Your Time: Pregnancy isn't the time to try to break a new personal record or to increase your speed or mileage (if you have never ran a half marathon before-this wouldn't be the best time to start training for one, for example..) Chances are you'll need to slow down your speed. In my first trimester, I was still able to run at the same speed that I ran before but I didn't run as far. Then when I got into my second trimester, my body showed me that I needed to slow down and that's when I incorporated walk-jog-run intervals, which really helped me exercise longer but at a less intense pace. 3. Take Breaks: You'll notice that you can't run nearly as long as you used to before having to stop and take a break. It's completely normal since your body is pumping twice the amount of blood! I take breaks often every time I go for a run and only continue my run if I'm still feeling good. 4. Don't Run To The Point Of Exhaustion: This is a serious no no and the one thing my doctor did mention to me. You don't want to run (or exercise in general) to where you can't catch your breath. Don't over do it. 5. Stay Hydrated: This might be the most important one! Always keep a full water bottle next to you and drink often, even if you don't feel thirsty. Drink water before, during (don't forget! ), and after your run. I've also heard that during the second and third trimesters it's better to run inside on a treadmill so you're at a lesser risk for falls. Luckily for me, this worked out perfectly because during the summer I was still in my first trimester and was able to run outside when I wanted to get fresh air/be outside, and now that I'm in my second trimester the weather is cooling down and I don't mind running on the treadmill. Lastly... if running is something you love it might be difficult to call it quits, but you should always listen to your body. You and your baby's safety is what's most important! And just remember you'll be able to get back into your normal routine in no time! Hope this helps some of you out there, or you'll remember these tips for the future! Have a great Thursday! *Don't forget to enter my Baby Age Blocks Giveaway! It ends soon! Great advice! 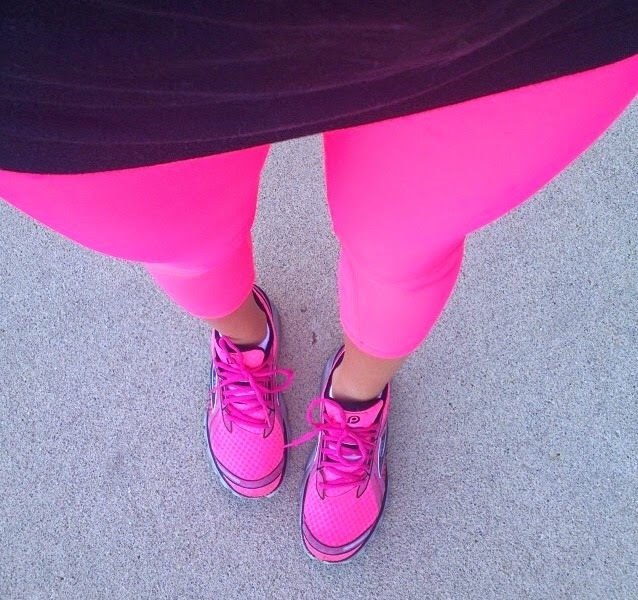 And oh my gosh, where did you get your hot pink running capris??? As a "runner" I love reading these posts. No babies for me yet, but I do agree it's just so important to listen to your body! You go girl! I saw a woman finish the half-marathon with me in May who was easily 6+ months pregnant and I have forever been inspired lol! I loved running and ran up until the doctor put me on bedrest with my first. My second (due to my preterm labor issues) I was never allowed to run and I felt MUCH better during my first pregnancy when I ran through most of my second trimester! Good job for you momma! I know several people that have completed 1/2 and full marathons while pregnant!